unless somehow my installation became corrupted, it appears that steel beasts no longer uses the below file to render grass, that is, you cannot paint terrain with this type of grass in the map editor. is this a choice to stop using it or did something in the program inadvertently change not to recognize it? 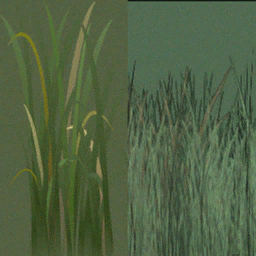 this file is called grasses.dds and still lives in the installation directory. the grass in the left pane is a nice looking texture to have and i would like to see it back. i see the issue- i didn't realize that there is more than one theme version of these files (using a desert theme, object #48 appears tan and resembles harvested wheat bundle, that's how i was overlooking it)- tanks.